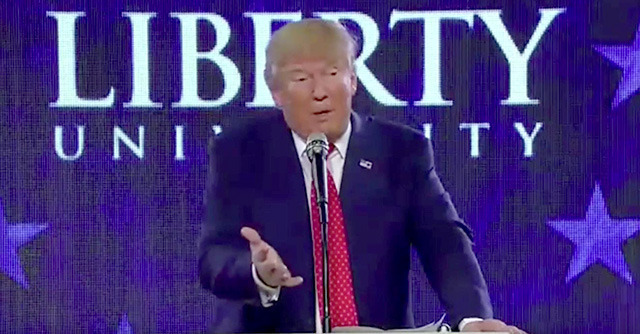 In a campaign speech at Virginia's fundamentalist Liberty University on Monday, Republican presidential candidate Donald Trump tangentially promised that he would force Apple to manufacture its hardware in the US instead of looking to overseas labor. "We're going to get Apple to build their damn computers in this country instead of other countries," Trump said towards end of the speech, according to Gizmodo. Earlier, he proposed a 35 percent tax on businesses making goods overseas, while still insisting that he supported free trade. Only one Mac —the Mac Pro —is currently assembled in the U.S., by way of a factory located in Austin, Texas. Apple otherwise relies on Chinese manufacturers for most of its products, both because of the cheap labor and because decades of previous outsourcing has allowed the American manufacturing industry to shrink. Trump has been a leading figure in polls for the Republican primary elections, the first of which start next month. These will decide the party's official candidate for U.S. presidential elections in November. Trump's run has been marked by a number of controversial statements, most notably a claim that he would ban any Muslims from entering the U.S., regardless of crimes, political views, or even national origin.